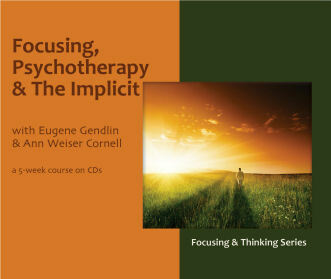 Focusing, Psychotherapy & The Implicit is a course to support psychotherapists and other healing professionals in being with their clients in a Focusing-oriented way. This is a slightly edited version of a live, interactive, 5-week phone course with the legendary author of Focusing and one of his most well known students. Focusing is a process that has been linked in over 50 research studies with successful outcomes in psychotherapy. Research has shown that successful therapy clients make contact with a felt sense – a murky, hard to describe, more-than-words experience that is broader and vaguer than emotion. With a certain quality of attention, felt senses can “come into focus” and bring fresh insights and new behavior. Format: Set consists of 5 full-length audio CDs. Note: CDs were recorded during an actual phone seminar and have been edited. Sound quality may vary. Eugene T. Gendlin is a groundbreaking philosopher as well as a psychotherapist who has been honored four times by the American Psychological Association for his development of Experiential Psychotherapy. His widely influential book, Focusing, has sold over 500,000 copies and is in seventeen languages. Ann Weiser Cornell was getting her PhD in Linguistics at the University of Chicago when she met and learned Focusing from Eugene Gendlin. Today, Ann is internationally recognized as one of the leading Focusing teachers in the world. She is the author of The Power of Focusing, and The Radical Acceptance of Everything.